"FASHION SHOW: 60 Years of Fashion Photography"
Over 40 diverse photographs celebrating the development of fashion photography are on display at ATLAS Gallery. "FASHION SHOW: 60 Years of Fashion Photography" charts the evolving styles of the medium, the depiction of the female form, and the making of icons alongside uncommissioned works by renowned fashion photographers. The photographs in the exhibition will range from the iconic to the experimental and the contemporary. 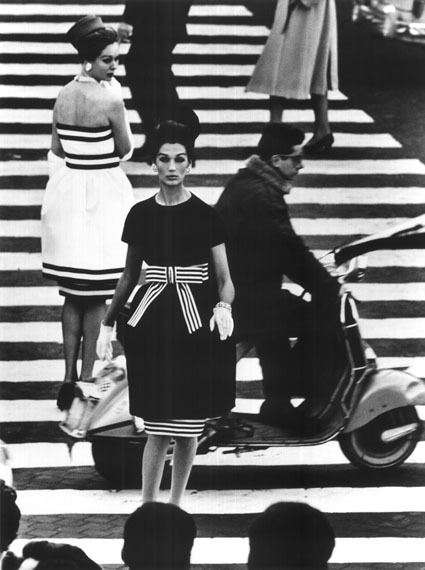 A previously unexhibited photograph by Erwin Blumenfeld created for Dayton’s Department Store in 1959-1960 will be shown alongside Lillian Bassman’s graphic black and white darkroom manipulations from the 1950s, Richard Avedon’s silhouetted portrait of model Jean Shrimpton from 1967, and William Klein’s iconic studio photograph "Hat and Five Roses" alongside his energetic street fashion photographs focusing on models Simone + Nina. A selection of works by Irving Penn, focusing on portraits of Lisa Fonssagrives, the model who became his wife, continue to exemplify the perfection of the 1950s. The progression of fashion photography from the 1970s onwards is illustrated primarily by a grid of 20 black and white prints taken by the prolific German Australian Helmet Newton. Created between 1973 and 1993, these depict athletic nudes, closely cropped portraits and candid shots with a naturalistic energy which removes this work from its predecessors in the previous decades. Steven Meisel’s photograph "Linda in Library" is indicative the rise of the supermodel in this era, and Tony McGee’s shot of Kate Moss in a car from 1988, shows a distance from traditional studio photography. This early shot of Moss was taken shortly after she was discovered by Storm, when she was sent to McGee’s studio to witness a photo shoot. McGee decided it would be a great idea to photograph her with a young boxer he was shooting in the Mercedes he had bought from David Hockney.